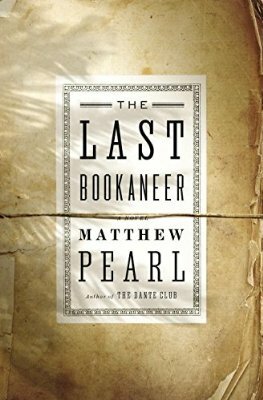 The Last Bookaneer by Matthew Pearl is an adventure novel. The fictional story creatively explores the intellectual property rights of authors. As a writer, I found the subject matter of great interest. Set in New York, Samoa, and parts of Europe, the story is narrated by a bookseller named Mr. Fergins, who plies his trade on the train, to a young African-American boy employed by the railroad. The story takes place just prior to the passing of copyright laws when Fergins was witness to the last great book theft by a bookaneer from Robert Louis Stevenson who resided in Samoa. I enjoyed a great deal of this book; was drawn into it by the adventuresome nature of the tale, and admired the author’s thought process with regard to the nature of books, the people who read them, and the people who publish them. The end of the book left me somewhat disenchanted because it brought to mind one of my all time favorite books, Fahrenheit 451. I do however, recommend this book because it really made me think about my love of reading and books in general. This entry was posted in Uncategorized and tagged book pirates, Books, booksellers, copyright law, fictional book, London, Matthew Pearl, New York, Samoa. Bookmark the permalink. Sounds like an interesting read. As a fellow book lover, I always like reading books about book sellers and readers. Now that you mention it, I tend to gravitate towards books that include some element of the writing life! I tagged a number of passages in this book which I found enlightening about writing in general. I think you will like this book.